Greek in origin, Takis develops ideas, approaches, methods, resources, assets, and tools, that will help you to grow and better your personal and professional life! Takis has managed, consult and cooperate with various organizations and companies in Greece and Europe in various business areas. Among them included public and private companies, organizations, agents, banks, and universities. He has also cooperated and associated with companies active in the international e-Learning sector such as the Blackboard (USA) and the Saba (USA). Takis shares his best strategies, mental models, ideas, and approaches for developing YOURSELF, according to your goals and your values! At the business level, he pays close attention to the group dynamics and the personal interconnections, trying to form and employ strategies and operations that would assist the company in an integrated manner and enhance its effectiveness towards its organizational, social, and enterprise activities. He aims at developing business and strategies having a win-win orientation towards all involved stakeholders while keeping the focus on the human and social aspects of the enterprises. Here is Takis’ personal blog, a place for recording his thoughts and ideas, providing value and tools to his readers and disseminating the most valuable bits of his work. Takis uses a specialized mindset based on leadership & strategy principles, personal growth directives, business proven practices, and training activities to deliver his best results to you! He employs and uses various approaches and tools using a mixture of techniques, including books, white papers, education, courses, coaching, mentoring, etc. He is the author of numerous free books, guides, and white papers developed in the process of providing more value and clarity to his audience! Takis writes and develops products and courses for topics related to business, e-Learning, leadership, marketing, productivity, effectiveness, management, time management, social media, and tools, while, occasionally, he writes about various subjects (he thinks!!!) of interest for his readers. His goal is to create meaningful and readily applicable approaches, ideas, schemes, etc. providing insights, interconnections, and tools that, could create a positive difference in various areas, and empower the people in their everyday personal and professional life. 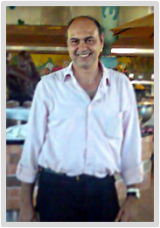 Takis Athanassiou has been working for over 20 years in the IT sector, as Project Manager, Team Leader, and Director in Greek SMEs, focused mainly in areas of IT services, e-Learning and consulting. His main focus is Leadership and Strategy while he helps people, groups, and companies to develop their goals and adjust to the “new brave world” of digital media, in order to stay innovative, creative and competitive. In order to do that, he uses various enablers (as the entrepreneurship, the technology, the financials, the e-Learning, etc. are) to empower the people in developing their personal and professional life and the companies to enhance their impact. Today he is working in the areas of business consulting, e-Learning and social media while he writes, blogs and discusses leadership, business, productivity, personal development, social media and tools that facilitate and support the flawless execution of everyday business and personal life. For more information for Takis, you can check Takis’ profile on LinkedIn. In case, you are wondering what Takis is focused on currently, you can check this link! You can contact Takis either by e-mail or you can reach him via the contact page of this blog. You can also follow him on Twitter, Linkedin, Google+, Facebook, Flickr, Youtube, Soundcloud, Instagram, and Pinterest. Takis Athanassiou | Leadership Initiative is the “personal activities base” of Takis online activities (either business, blogging, networking, etc). But this site supported and supports other blogs as well and have some more “outposts“, around the Internet, for sharing and propagate the ideas, approaches, and tools, discussed here. Pursuant to new FTC regulations, Takis has developed this page of disclosures so that it’s clear when he is writing on behalf of someone else. Occasionally Takis publishes some sponsored articles for products and services he thinks of value! The domain and host provider of this blog is the company GoDaddy, and this blog is being developed on the blogging platform WordPress. For the blog has been used a professional responsive theme the GetNoticed Theme for WordPress and various third-party services. Most notably Disqus for integrating comments, FeedBurner for RSS and MailChimp for marketing campaigns and email subscription. Finally, for server tasks and traffic monitoring, it has been used GoDaddy tools, Google Webmaster Tools, and Google Analytics. This is my personal blog, takisathanassiou.com. All content provided on this blog is for informational purposes only. The owner of this blog makes no representations as to the accuracy, completeness, currentness, suitability, or validity of any information on this site or found by following any link on this site. The owner of this blog will not be liable for any errors, delays or omissions in this information nor for the availability of this information. The owner will not be liable for any losses, injuries, or damages from the display or use of this information. All information is provided on an as-is basis. For further policies related to various operations of this site, you can check here!